Hiperia3D News: What is a Virtusphere? 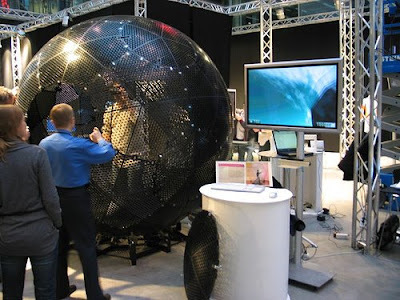 A virtusphere is a virtual reality device that basically consists in a big sphere inside which you enter and run like a hamster. It uses to work combined with other virtual reality devices. The hardware registers your movement so your avatar moves with you while you are actually walking inside the sphere. Also have a read to his blog, as you may find it a really interesting one.